SDS EasyBenders – AmeriKen Online! 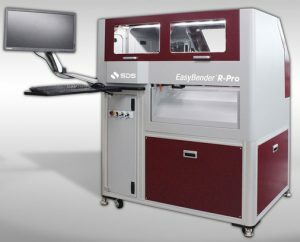 EasyBender S1 is the newest model of the automatic steel rule processor / bender that revolutionized diemaking. Incorporating the same reliable design that has become the diemaking industry standard, it features our latest software and an elegant new cabinet design. Waiting for the right time to buy? This is our most affordable fully automated steel rule bender yet. The steel rule processor that changed the way the world makes dies is now available at a price you would expect to pay for a refurbished bender. Get the best value for your money and the shortest return on your investment with an EasyBender S1 from SDS, now available through AmeriKen. View specs here. 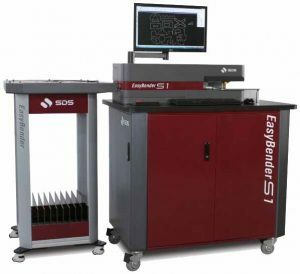 Fast, accurate, and reliable, the new fully automated SDS EasyBender NS2 steel rule processor / bender precisely cuts (straight and miter with bevel support), bends, and notches steel rule. Its patented bending mechanism and single linear process produce one or 100 pieces of rule that fit the die the first time, every time. EasyBender NS2 is available in models that can process and bend 1.5, 2, 3, and 4-point rule, up to 2″ high. Incorporating the same reliable design that has become the diemaking industry standard, it features the latest software and a sophisticated new cabinet design. Patented adjustable height notching, cutting and mitering tools, and inline nicking and broaching are just a few of its advanced features. The EasyBender NS2 steel rule processor can be customized with a multitude of options, including additional tooling modules, nick grinding unit, and custom punches. Get the most advanced features and the shortest return on your investment with EasyBender NS2 from SDS, now available through AmeriKen. View specs here. The SDS EasyBender R automated steel rule bending machine notches, cuts, miters, and bends curved rule for 66-inch circumference rotary cutting dies. Using no-notch curved serrated rule, our proprietary software can add relief notches automatically or manually. The ability to add relief notches only where necessary enables you to build a stronger rotary cutting tool that performs better and longer on the diecutting press than one made with standard pre-notched curved rule. 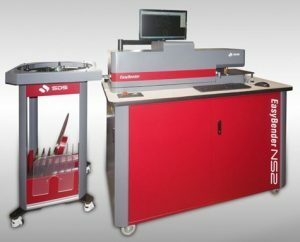 Featuring a servo-controlled grip feed system for precision, a robust hydraulic cutting system for strength, and our patented and proven bending mechanism, EasyBender R automatic steel rule bender produces the most accurate and fully closed bent pieces possible on an automated curved-rule bending machine. View specs here. 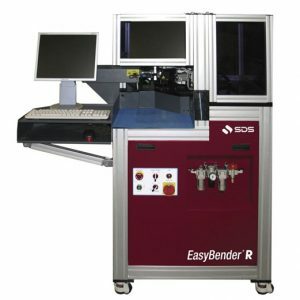 The newest SDS bender, the EasyBender R-Pro, adds a new dimension to rotary die bending through its multi-diameter adjustability. With the capability to bend rotary rule from 10 to 27 inches inner diameter, this machine provides die makers the flexibility and reliability needed in the rotary dieboard industry. Featuring a positive roller feed system for precision, a robust cutting system for strength, and our Patent Pending bending mechanism, the EasyBender R-Pro automatic steel rule bender produces the most accurate and fully closed bent pieces possible on an automated curved-rule bending machine. View specs here.